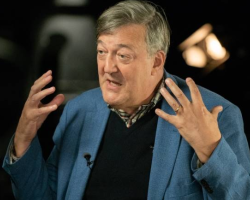 Actor Stephen Fry is an atheist and he’s done a lot, publicly, to advance freethought. His recent interview with the CBC in Canada was a bit of disappointment when he seems to side with people like Jordan Peterson concerning politically correct speech. This entry was posted in Humanism, Politics, Progressive and tagged bigotry, free speech, Jordan Peterson, political correctness, Stephen Fry on May 20, 2018 by Doug.